Lately, my Friday night routine involves doing some schoolwork, waiting for my boyfriend to arrive from DC, and taking a short break to bake something sweet. (Said boyfriend and I then spend the remainder of the weekend eating said baked good.) 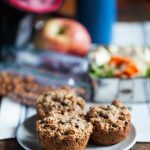 Lately, the treat of choice is muffins, and these vegan zucchini date muffins are my current favorite. 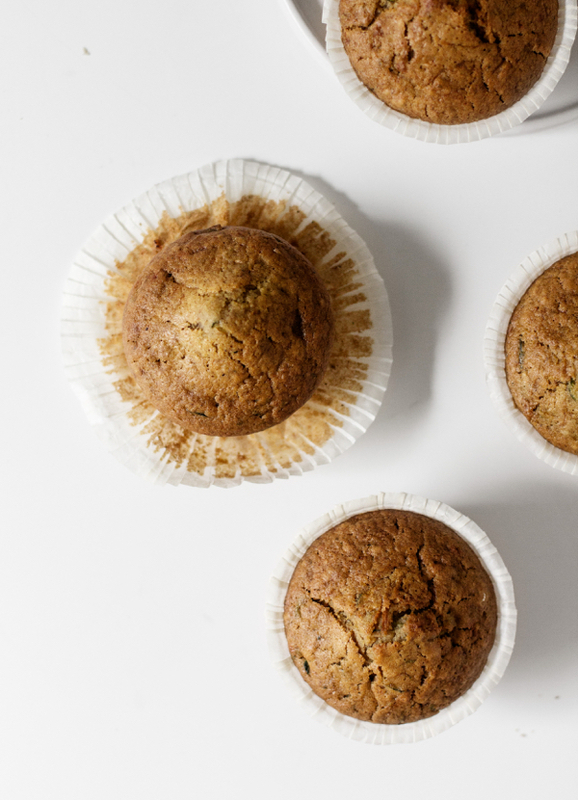 These muffins are everything a muffin should be: sweet, moist, and totally snackworthy. Yet they’re also packed with some zucchini, which means that they don’t demand too much fat for moisture or a good crumb. They’re also studded with pieces of tender, sweet Medjool dates, which add a lot of natural sweetness and fiber to the dish. Cinnamon and ginger add flavor and an undeniably tempting aroma. I like to use spelt or whole wheat flour for this recipe, but an all purpose gluten free mix will also work well. If you don’t have dates at home, you can substitute raisins or chopped prunes, which will also add nutrition and fiber! Preheat your oven to 350F and lightly oil a muffin baking sheet. In a large mixing bowl, whisk together the flour, baking powder, baking soda, ginger, cinnamon, and salt. In a medium sized mixing bowl, whisk together the applesauce, oil, non-dairy milk, and sugar. Add the wet ingredients to the dry ingredients and mix until they're just combined. Fold in the zucchini and date pieces. Pour batter into the prepared muffin pan and bake until the tops of the muffins are golden and a toothpick inserted into the muffins comes out clean (about 15 minutes). 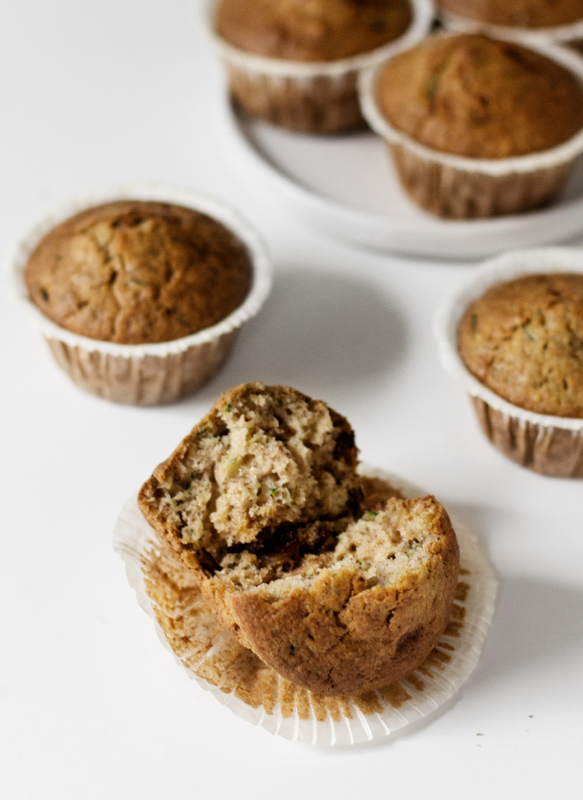 Transfer the muffins to a wire cooling rack and allow them to cool before serving. 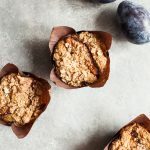 These muffins are especially fabulous with some Earth Balance or jam, but a touch of nut butter would be a good topper, too. With that said, the dates add so much flavor and sweetness that the muffins don’t need much dressing up. They’re really delicious as they are, either for part of breakfast or for a tasty afternoon snack. Hope you enjoy them! On that note, a new week begins. Tune in tomorrow for a special NEDA week post! Love your tradition 🙂 Never had dates in zucchini bread or muffins before – sounds delicious! The muffins look fabulous! It’s ironic that you just linked your post to carrot raisin muffins. I just made No Bake Oatmeal Raisin Carrot Cake bites. I totally forgot about your carrot raisin bran muffins. I have to say, the zuke muffins are really stealing the show! They look wonderful…moist, delish, and flavorful. And it’s very cool that you and M have an every other weekend arrangement so that it’s equal on both of you for commuting to the other’s city and you rotate like that. 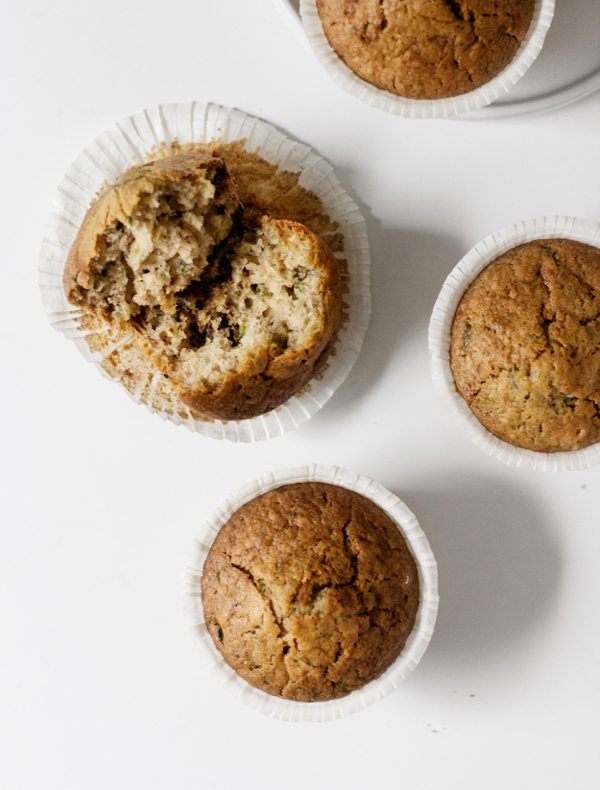 I love zucchini muffins- the addition of chopped dates is interesting. Wow these look delicious. I think I’m going to have to finally buy a muffin tin. Baking a bunch of muffins for the week is a really good idea, usually the only time I have a good breakfast for 4 or 5 days in a row is when I make quiche. SWOOSH! (That was the sound of me high-fiving the air in lieu of you.) Brilliant! I adore dates and spices and muffins. Gotsta make me this soon! Mmmm, these sound right up my alley– sweet, veggie packed, and whole- grain! I totally approve and love all the ingredients, too! Could you sub spelt flour instead of WW? wow looks super satisfying and tasty!!!! Yum! These sound sooo good and I love that they can easily be GF! I had to read the recipe about 4 times before seeing how much zucchini was needed. I’ll need to make a supply of these and keep them in my freezer for late night study sessions (like this one is shaping up to be). These sound wonderful…look great too of course. My boyfriend is definitely a fellow muffin lover so I can’t wait to make these for both of us! aw what a nice little tradition :). I love to bake for my boyfriend as well! I used to love muffins, though truth be told I don’t remember the last time i ate one. I do however sneak vegetables into baked goods and raw desserts all the time. I love zucchini in particular for its mild taste. I really enjoyed this – thanks for all the inspiration. LOVE that baking tradition! It’s all about balance and what a great way to unwind. 🙂 These muffins sound so great; can’t wait to try. This looks like a good answer to the zucchini in my produce bin and slightly old store of dates! Thanks! If the dates add sweetness can the sugar be omitted completely? I have never cooked with dates and am not sure how sweet they really are. Mmm these look delicious! I’m sure M appreciates freshly baked goods after a long journey 🙂 I have been craving muffins lately, and I just acquired a set of muffin tins. I will have to try these. 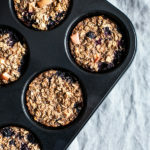 What a great (and intriguing)muffin idea! I’ll add those to my “to make” list. Wonderful! 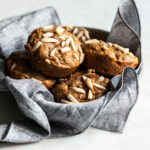 What a wonderful tradition and these muffins look wonderful, I’m curious to try them the unique list of ingredients! Thanks! These look amazing! I love baking with dates! I’m currently living in Melbourne and have yet to see sucanat anywhere! Organic coconut sugar is readily available, which is a good alternative so perhaps i’ll use that instead. Definitely making these babies soon! Thanks, Gena. 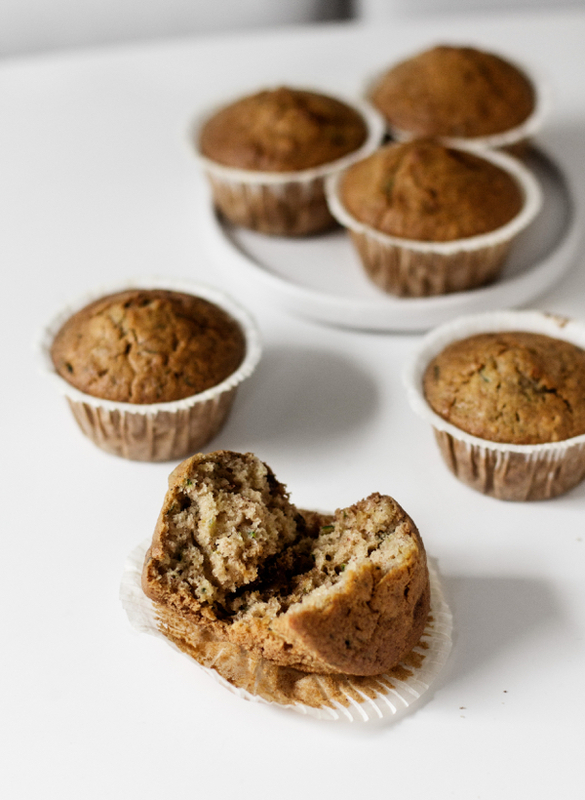 These are seriously healthy muffins, unlike the huge muffin shaped pieces of cake all over town. I need to make them soon. What a sweet tradition! I’ll file this away for zucchini season this summer when folks are giving away bags of summer squashes. PS – if you call them cupcakes, there is a much bigger chance your kids will eat them. It’s all in the marketing! Wow Gena these look wonderful! Thank you for the inspiration. I’ll be making these for sure!! These look so good, I’m making these very soon,I love dates I use them alot to sweeten things especially smoothies I love bitting down on the sweet bits of dates throughout my smoothies.Do I use the same amount of gluten free flour as the whole wheat? I just made these muffins they are amazing! Thanks for sharing the recipe. very nice, looks delicious. I will try this weekend! I made these for a brunch yesterday because we have some vegan friends and wanted them to have more than fruit (also made vegan waffle mix). As it turned out my vegan friends couldn’t make the brunch but everyone was happy to goggle up the muffins. Only 1 was left. I made these for the protestors staying overnight across from my office for Occupy Wall Street (occupywallst.org/)! Good nutrition to keep them going all day long. Just made these today with some zucchini we got in our csa share this week & we all loved them! Our two-year old downed hers so quickly, I actually checked under the table to see if she had lost it 🙂 Thanks so much!